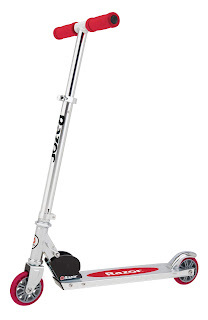 Hurry over to Walmart.com where you can score this Razor A Kick Scooter for only $18 (Retail $29.99)! The Razor A Scooter is the perfect scooter for your kids to get moving. The Razor A features an updated deck design constructed with aircraft grade aluminum. Tipping the scales at only 6 pounds, this scooter is super easy to take along where you go. The patented folding mechanism makes the scooter compact and easy to carry. Kids ages 5 and up will love this scooter and parents will love that the Razor A requires NO ASSEMBLY!